The news has just been released, complements of USAToday.com. 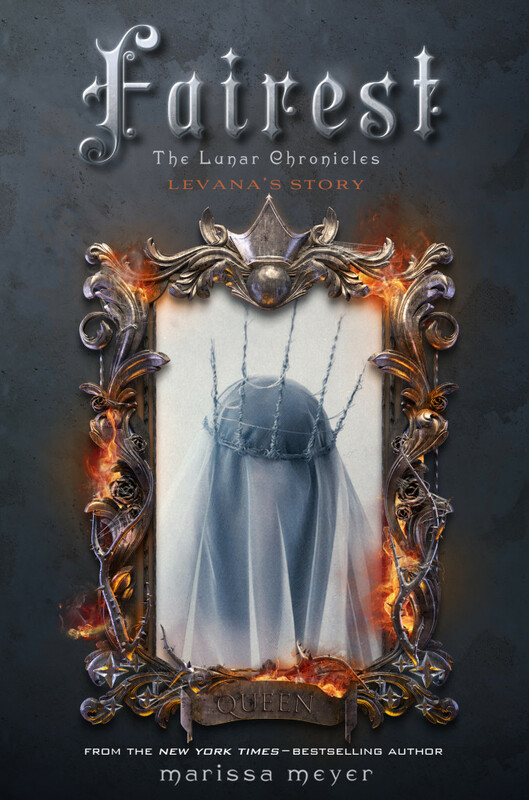 I’ll have a new full-length novel coming out in January titled FAIREST: Levana’s Story, and just like the title suggests, this book will be delving into the backstory of Queen Levana, the wicked tyrant of The Lunar Chronicles. Add FAIREST to your GoodReads lists here. On sale January 27, 2015. HAVE QUESTIONS ON FAIREST, WINTER, AND THE LUNAR CHRONICLES? I’ll be answering them during our Google Chat, this Wednesday, June 18, at 9:00pm EST / 6:00pm PST. Hope to see you there! I have conflicted feelings! I am so happy about learning of Queen Levana but I am also so sad about winter being pushed. Happy and sad. Lol. STOP IT, JUST STOP IT. DO YOU, LIKE, ENJOY KILLING PEOPLE WITH EXCITEMENT?? IT IS CRUEL AND FRUSTRATING, BUT OMFG MARISSA MEYER, YOU ARE PERSONIFIED PERFECTION, YOU ARE MY QUEEN LEVANA, MY QUEEN OF HEARTS AND I SWEAR TO GOD, I SWEAR TO GOD, I WOULD GIVE AWAY MY DOG TO HAVE WINTER, FAIREST AND HEARTLES… I WOULD GIVE AWAY MY HOUSE! THAT COVER THO, YOU CAN’T EVEN HANDLE THAT COVER, NOBODY CAN HADLE THAT COVER, IT IS TOO MUCH, I AM LITERALLY FANGIRLING, I JUST FOUND OUT AGHHRG THAT COVER!!! THAT FRIGGIN COVER, I NEED IT IN MY SHELF IN BEAUTIFUL HARDCOVER ALONG WITH THE REST OF THE SERIES ASAP, LIKE NOW. Yay!! This is so awesome! I just finished reading Captain Thorne’s Guide to Being Lucky and I can’t wait to read the next story/book! 😀 Levana’s point of view sounds really interesting!!! How is someone suppose to react to this because I’m happy about the new book but I’m devastated at how long I have to wait for winter now. By the time the book will be out I’ll be exhausted from waiting. Ok I can do this…. WHO AM I KIDDING I CANT DO THIS!! THIS IS TOO LONG A WAIT I WILL HAVE A HEART ATTACK! I CANNOT WAIT THAT LONG FOR WINTER!!! NOVEMBER… NEXT YEAR???!!! Personally, I’d rather read Winter first, but I guess it isn’t my decision, so Fairest will have to do until Winter is finally released. Can’t Winter be released in July or something? Just not after October!!! Fairest sounds like it is going to be awesome. I am having one of those excite fan girl moments where I have to tell everybody an awesome book is coming out and I want to read it NOW! Uuuuggggggghhhhhhh WHY??? Cress ended with Scarlet STILL trapped on Luna, and now we have to wait until NEXT NOVEMBER to see them bust her out?! I can’t wait that long for a cliffhanger like that to be resolved!!! I mean it’s great that Fairest is being written, but SEVENTEEN MONTHS UNTIL WINTER COMES OUT?!?!?!?! this sums up how i feel: 🙁 🙁 🙁 🙁 🙁 🙁 🙁 🙁 🙁 🙁 🙁 🙁 🙁 NOOOOOOO…..!!##%%&&**(()???!!! I was wondering, u know how you did coping strategies on cress why not do that with winter?? And maybe how you came up with fairest, and the writing process of that etc. I think those 2 things would be super cool! SO CONFLICTED… And now I have to wait longer to test my theory about Winter!!!!! And no Cinder/Kai interaction!!!!!!!!!! But this does mean that there’s more reading material… so the lunar chronicles will last longer! Also, judging by the Winter teasers you released, and by the chapter in Levana’s POV in Cress, Levana had an interesting past, which I would very much like to read. There’s a plus to everything.! Uh, you mispelled compliments. You did complements. IT COMES OUT A DAY AFTER MY BIRTHDAY! YAYYY!!! OMG I think that Heartless will be about Iko because she has no heart beat…. OMG!!!!!!!!!! !NO FAIR!!!!!!!!!!!!!!!! (Thank you LiamZee) I want that book in beautiful hardcover!!!!!!!!!!!! !You can just postpone Levana’s story instead right?????? ?Anyway,what is Heartless, is it the fifth book or something because I really need that book too u know.WINTER!!!!!!!!!!!!!!!!!!!!!!!!!!!!!!!!!!!!!!!!!!!!!!!!!!!!!!!!!!!!!!!!!!!!!!!!!!!!!!!!!!!!!!!!!!!!!!!!!!!!!!!!! Wait so is Fairest the third or fourth book? Dying over Winter… At least now Winter comes out in the winter. Fairest is the fourth book to be published (Cress was #3), but is a prequel that takes place before the series. Winter will then be the final (fifth) book. I’m so so surprised!!!! So amazing! I don’t know if I’m happy or sad. Fairest is coming! But Winter takes longer! Just keep the amazingness coming! Eeeeeeee!!!!! I’m super excited! At first I was sad that winter was coming out late but I’m glad that we get to see how Levana came to be. BUT IM REALLY, REALLY SAD THAT THE LUNAR CHRONICLES ARE ENDING. it’s like that with all the seiris I’ve read, Harry Potter, Gallager Girls, Ingo, and now the Lunar chronicles! I’ll be interested to see if this can engender any compassion in me for Levana. I suspect she has a tragic backstory… the mysterious ring she thought would bring her happiness and so on… but she’s just so callous! I’m intrigued. Though of course I am most looking forward to Winter and the conclusion of the saga. I’ve just finished the three books. The books are excellent. I am just a little disappointed that I started this series too soon. I cannot put myself through this torture of getting Levana with no finality in sight until maybe November, if that is it with Winter. I will have to clear my mind of this book and have my daughter remind me in November to get these two in hopes that Heartland is not a continuation of bad times. Excellent excellent excellent books but I can’t hang on this cliff. I’ll climb the mountain again in November. Hey! Huge fan. 🙂 I preordered this in December but my order says it’s awaiting publication and it won’t be ready until March? Is this a Canadian thing or just from Book Depository? 🙁 I’m so bummed. I really loved Fairest, especially Evert. Oh gosh! However, I wanted to see the full colour art but I didn’t get it. I think its because I got the international version. Its really sad though… Can I see it? Please? Thank you! Oh my god!!!!!!! Thank you to Marrisa Meyers!!!!!!!!!!!!!! I absohootly loved your books!!!! My best friend Mateo and I just finished cress. Please please please answer me this!!! How did you get insperation for this series?!?! And can you give me some tips on how to write a story??? ( P.S next time your on a book tour, come to Austin Texas)!!!!!!!!!!!!!!!!! I have introduced these books to one of my classes, from a book report, now 15 people are reading them! When will the cover be announced for Winter? ALSO COME TO SAN DIEGO CA!!!!! I love the series so far, but I can’t really wait for Winter to come out!!!!! It’s so good!!!!!! Want to know what happen next!!!!!!!!!!!!!!! When is queen Levena’s birthday? Fairest isn’t a novel, it’s a short story or an essay. Such a huge disappointment… I didn’t realize I was going to waste money on a book that offered no new information or insight…. Not cool. I absolutely loved the first three books in the series and I hope winter doesn’t disappoint, but making your readers pay for fairest doesn’t seem right. What age is Queen Levana when she married Evret?